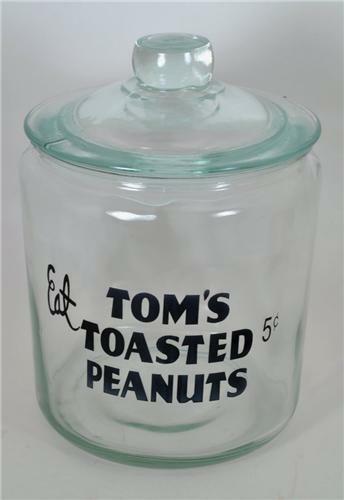 This is a nice thick Counter Display Jar with "Eat Tom's Toasted Peanuts 5 Cents A Great Kitchen Conversation Piece. No chips, cracks, or hairlines on this one. Has some manufacturing air bubbles as is usual. this and create the tight seal. Width: Approximately 7 inches in diameter at bottom of jar. This offers a great old and early antique & vintage primitive style presentation that will enhance any collection, home, or office decor!